Kovakkai in Tamil, tindora or tondli in Marathi,Kovakka in Malayalam Dondakaya in Telugu Tondekayi in Kannada. Fry the chili and dhal in golden. Fry the chopped kovakkai, till it becomes tender. 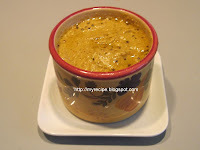 Grind kovakai urad dhal, chili, asafoetida, salt coriander leaves and tamarind. into a paste. Heat a pan with oil add mustard seeds and curry leaves. When it splutters add to the chutney. It is a side dish for dosa/ idli/ rice or chapthi.